As we mentioned last week in our email newsletter, the backcountry community has a unique opportunity to preserve a significant parcel in the Wasatch from not only future development but also for enhanced recreation opportunities. And instead of begging the Forest Service or Congress or the President to save it out of principle, this time the community will do it the old fashioned way: buying it. Bonanza Flat is the large area that lies below (to the east) as you crest the steep climb of Guardsman Pass from Big Cottonwood Canyon in the summer. Due to its development-friendly nature and proximity to Deer Valley and Park City and now -with the paving of the entirety of highway 224 that comes up from the Heber Valley – Wasatch County and Midway developers have long wanted to literally spread the wealth of the neighbors into that area. Most recently Talisker – of Canyons and Ski Link fame, before the sale to Vail Resorts – owned Bonanza Flat and wanted to develop it, but through Talisker’s exit and a variety of financial transactions the bank now owns it and wants to capitalize on that investment. Because any potential development up there would involve not only high end homes, but also likely at least one hotel, a golf course, and maybe even ski lifts, the land is understandably quite valuable. But the bank is willing to forego the developers offer if The Community finds that area valuable enough to purchase it from the bank at the agreed-upon value, which is a daunting-sounding $38 million for the 1350-acre parcel. However, for high end real estate development, $38M is not a huge number; for Deer Valley-style homes and hotels this is a relative per-acre bargain. Especially because this area has water, which is vital to any development, much less for upper Wasatch land development. Once Park City’s town leaders saw there was an opportunity to acquire the property, they immediately put a $25M bond up to the voters of Park City, who approved it in the November election. Considering that Park City’s population is only 7800, this is a lot of money for the taxpayers; they clearly put a lot of value on it! About $10M of the $13M is being sought from various local municipalities, which leaves “only” $3M to raise, which the various government entities feel could/should be raised by the communities that stand to benefit most from preservation, and are represented by nine different orgs that includes – among others – Mountain Trails, Friends of Alta, Save Our Canyons, the Sierra Club, the Nature Conservancy, the Summit Land Conservancy, and yes, the Wasatch Backcountry Alliance. Utah Open Lands is the “main” org leading the fundraising charge, and with their 25 years of experience in purchasing conservable lands, they are well qualified to spearhead this effort. As we noted in the previous message, it’s easy to dismiss a place called “Flat” because it doesn’t sound like very good skiing! But this is a bit misleading: the parcel extends up the ridge to the top of Peak 10,420 and part of Clayton Peak, which both have nice bowls and glades on them. But from a backcountry rider’s perspective, the parcel is even more important because it is one of the potential key areas to executing Ski Utah’s One Wasatch idea, which – despite not much news about it this year – is still very much part of their Master Plan. 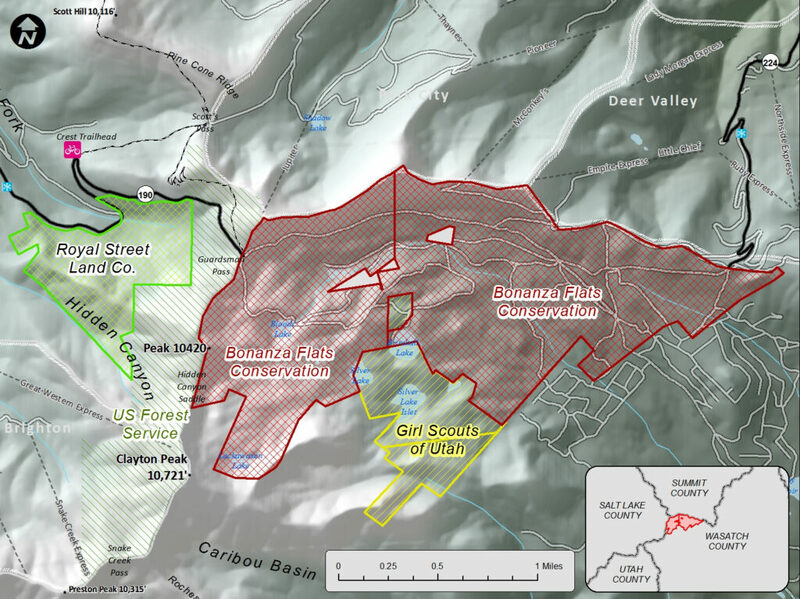 It’s easy to see that preventing development in these areas would make chairlift/gondola/tram connections between Park City and Big Cottonwood canyon difficult. For those of you who are mountain bikers and hikers when its not ski season, this parcel has a lot of value in that it’s an area that’s quite conducive to trail building, and Mountain Trails is already in the planning stages of not only extending the top of the new WOW (Wasatch Over Wasatch) trail that comes up from Midway but also creating an entire network in that area that may connect to the upper PC/DV trails and the Wasatch Crest Trail (for reference, the area is twice the size of Round Valley!). And speaking of the Crest (or “Ridge”, as the Park City folks call it) the Bonanza Flat parcel does includes the challenging parking area for the trailhead to access the popular Wasatch Crest trail, so development up in that area could complicate that trailhead instead of alleviate the crowding there. Mountain Trails also has the potential to groom plenty of trails in that area for Nordic skiing, snowshoeing and fat biking. One of the reasons that Grizzly Gulch has given the Wasatch Backcountry Alliance and the Mountain Accord so much angst over the last few years is that Alta Ski Lifts quietly bought that land for a relative song back in the 1990s. WBA has actually proposed to buy that land, but ASL has not been interested in selling (yet!). But Bonanza Flat represents a unique opportunity in the Wasatch: The Community can come together to purchase land for preservation and human powered recreation and permanently avoid the “mountain village”-type development that is so prevalent near ski resorts. The Community needs to come up with $3million. As one of 9-10 orgs trying to raise these funds, Wasatch Backcountry Alliance would like to commit to $300k. We have 2000 formal members, which would mean $150 for each and every member, but if all of our Facebook and Instagram members would contribute, it would only be about $40 per person! At this point we are confident that if the deal falls through, WBA and Utah Open Lands will be able to refund your donation, if that is what you desire (both groups could/would undoubtedly be able to use the money for later battles). The Wasatch Backcountry Alliance will match the first $15k that we receive in donations, and we are working on other fired-up donors to creating matching funds as well, and our upcoming film festivals and the shuttle day’s proceeds will go towards Bonanza Flat. This is an all out effort. Again, this is the best opportunity to assure that we maintain the balance between developed and non-developed areas and limit ski resort connectivity and preserve some vital local lands that we’ve ever seen, and we hope that you join us in this campaign.